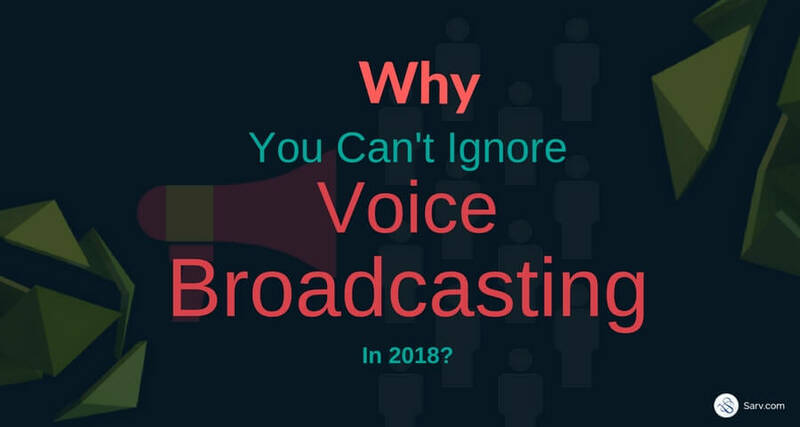 Why You Can’t Ignore Voice Broadcasting In 2018? The present age is the age of invention, the age of development, the age of technology. If we look at the way how people use to buy products earlier, you will feel that today we are living in the dawn of the modern era. And Modern era has revolutionized the way commerce operates. But this also puts some challenges among the retailers. And with the emergence of conversational commerce, customers can barely wait for a response or news about the product. They instantly want to know which is the upcoming event, what are the new features of a product, new promotional offers available etc. Hence indeed a challenge for retailers. So now retailers put a lot of efforts to provide the better digital experience to their customers, and this has significantly led to the rise of email marketing and cloud telephony services. And voice broadcasting is one of the popular methods of cloud telephony. It’s a mass communication technique which helps you to broadcast telephone message to hundreds of people at the same time. Believe me, it is an incredible marketing tool which helps you to communicate with as many people you want. What is Voice Broadcasting and Why you can’t ignore voice broadcasting in 2018? This is itself a million dollar question. I know that a lot many questions are going through your mind like what is voice broadcasting? what are its uses, how to choose whether Voice Broadcasting is beneficial for your business or not and who is the best provider? So before proceeding with how it can prove to be beneficial for your business. Let’s start with the basics. In simple words, voice broadcasting is a technique of communicating with masses through voice message. It helps you to deliver your message to your target audience. Nowadays businesses are turning towards voice broadcasting to give user augmented reality experience. All businesses today are putting a lot of efforts to provide better experiences to customers and engage more and more with them. And this has led to the emergence of Voice Broadcasting. Voice broadcasting is affordable still one of the successful tools of marketing. An instant access to masses. What else is needed? Also Read:- How to Generate Qualified Leads With Minimum Investment? 1) Consistency - It’s quite hectic to connect with all your customers manually one by one. Voice broadcasting gives you the satisfaction that your every customer is receiving the exact message and information you want to deliver. It allows uniformity and consistency of message. 2) Fast and Secure - Voice Broadcasting- the name itself means broadcasting voice message to your audience at the same time at once. One of the fastest way to spread any news or information. 3) Personalized – Customers give more importance to voice messages over emails. Because the email goes to junk if it’s not properly designed but this is not the case with voice broadcasting because voice messages are easy to compose and share. No extra efforts required by a sender to create the campaign and listener to pick the call and listen to a message. Moreover, you can also give a personal touch with a scripted message which will leave a lasting impression on customer’s mind. 4) Scalability - Voice broadcasting provides a high level of scalability by generating hundreds and thousands of voice calls instantly and at the same time. This is one of the biggest advantages of the business having a long list of clients or marketing list. In this case, voice broadcasting can prove to be extremely valuable. I can talk about Voice Broadcasting all day long. But to make it short I have summed up it in 4 points. So don’t give it a second thought. Go and choose the affordable and reliable voice broadcasting provider that fits all your need and business requirements. Take your business to the new edge.